Federal Road Safety Corps is statutorily placed under the Presidency with the Office of the Secretary to the Government of the Federation (SGF) as the Supervising Authority. 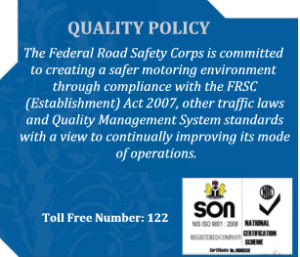 The Governing Board has the responsibilityof Policy Making, and Administration of the Federal Road Safety Corps. The FRSC Management is however, empowered with the day to day running of the Commission under the Corps Marshal and Chief Executive.